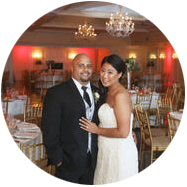 "We had heard about soundview through a few of our friends that were very impressed with it when they were looking for their wedding venue. It was one of the first place we looked and the one we liked the best throughout our search. From the moment we met with Michael we felt like part of the family. Michael is very easy to deal with and what you see is what you get. It is a pleasure to deal with someone as straightforward and honest as Michael. After we signed our contract with soundview and started working with the staff, we found them all to be extremely eager to please, responsive and easy to work with. They have an excellent team in place. The day of the wedding went better than we could have ever expected from Diego handling all the behind the scenes stuff, to Ricky orchestrating everything. We had filled out some of our paperwork wrong for the ceremony and Ricky handled it in stride and made sure that our wedding party was on point. Andrea made sure I had food at the cocktail hour and that there was never anything my husband or I needed. Michael was there to make sure that the ceremony happened as perfect as we could have imagined and we were very comforted by that. Our guests keep raving about the food in the cocktail hour! Overall we spend a great amount of time into the details of our wedding and we feel it couldn't have gone any better. 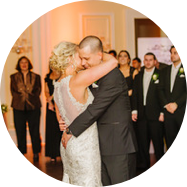 It is also a huge bonus that soundview has only one event per day because you really fell like the venue is your house for the day." "Amazing amazing amazing! Our guests can not stop raving about this beautiful venue inside and out and how delicious the food is at both cocktail and dinner!! The service was outstanding. Ricky and Diego are absolutely fabulous! If Ricky didn’t remind us to eat we would’ve never eaten. If my dress needed a fluff he was there right behind me. He walked me through the whole day! When we needed a ride Diego drove us around the grounds so we didn’t need to walk an extra step he was there every step of the way as well! Mikayla our bridal attendant was wonderful she didn’t leave my side and was sweet and courteous all evening even when it got hectic. I can not explain in words enough how happy we are that we chose to have our wedding at Soundview!! Thank you a millions times over!" 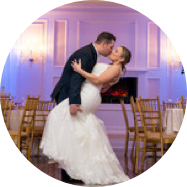 "Over a year ago my now husband and I started our journey to look for a venue for our wedding that fit what we wanted, after looking at 5-6 venues our last and final stop was Soundview Caterers. The moment we walked in to Soundview we knew it was exactly what we wanted very modern and sleek (no ugly gross rugs here). We sat down with Michael and he was willing to move a party to offer us our wedding date 11-11-17. The day before our wedding we brought boxes of decorations etc. and I had specific directions of where and how I wanted everything set up. Diego the best maître d wrote every “demand” I was requesting and on our wedding day he nailed it, every single detail was met perfectly. I’m not the easiest person to please and I was extremely pleased (miracle). Now the night of our wedding had started and the cocktail hour was amazing every person I spoke to was raving about the food, drinks and what a great touch the piano player and outdoor area with heaters was for ambiance. The main event the reception it went off with out a hitch with the help of Michael’s amazing staff and I can not leave out the amazing house DJ Ultimate Sound. The room was absolutely gorgeous from the up lighting to the monogram of our names to the beautiful table set up including our cake showcased so perfectly, I could not be happier, the fireplace where we sat was a beautiful back drop for pictures, not that I took to many pictures because I was dancing pretty much the entire time to my awesome DJ along with acoustics and sax player who were probably the best I have ever heard. I have literally spoken to all my family friends since our wedding and have received the same response and I quote “one of the best weddings they have ever been to”. The amazing appetizer duet, pasta and entrees were delicious and I can not forget our mini passed out sorbet cones and Taco Bell exit station, perfect ending to a perfect night. John and I were impressed at the staff at the Soundview the employees were very professional and service was excellent to us and our guest. I want to thank Michael, Diego, Andrea & Diane for one of the best night that we will never forget." "As we sit here, thinking of how perfect our wedding day was, it truly brings tears to our eyes. Thank you all so much for everything you did to make our day perfect beyond words – better than we could have ever dreamed of!!! From the gorgeous room and décor to the amazing food and service, each and every detail was taken care of beautifully. We can easily say, November 4th, 2017 was the best day of our lives and we owe so much of that to Soundview. Michael, your honest (and hilarious) approach from day one was really what drew us in and made us feel comfortable. We felt like we were being treated like family from the beginning and that is something that not every venue can offer. Never ever change that! We appreciate you taking our food allergies into serious consideration and for arranging to add baby lamb chops to the menu a week before the wedding ☺ By the way, everyone said they were amazing and everyone RAVED about the food in general. The cocktail hour was so beautiful – many out of state people thought it was the dinner!! Sara and Diego, thank you so much for being so kind, for answering all of my questions and for simply being there for us from start to finish. We truly appreciate it from the bottom of our hearts. We had so many people tell us that our wedding was the best wedding they’ve ever been to—hearing that makes all of the wedding planning stress worth it and we couldn’t have done it without you guys. THANK YOU, THANK YOU, THANK YOU!!!!!!! 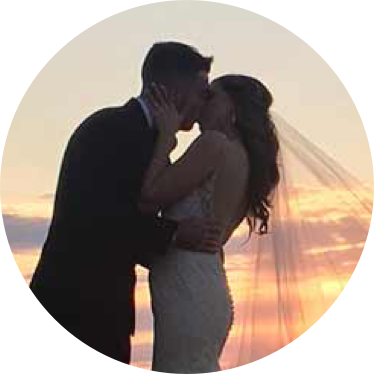 We are forever grateful for the Soundview and their amazing staff"
"Soundview Caterers was the first and only venue we visited and we 100% made the right choice. From the beginning, everyone at Soundview was so helpful and accommodating. 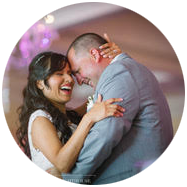 They made wedding planning less stressful and when it came time for the big day, they did a fabulous job. Everything went so smoothly and our Maitre D Diego was awesome. All of our guests had a BLAST and have been raving about how much fun they had and how amazing the food was. The fact that Soundview only does one wedding at a time makes such a difference and the whole time you’re there, you feel like you're part of the family. Thank you so much to Michael and the entire team for making our day so amazing!" "Where to begin with this amazing venue! We got married at Soundview on July 14, 2017. We knew we wanted a venue with a water front view. We looked at a few places around Long Island and just didn't have that "wow factor" feeling. When we discovered Soundview and made our appointment with Michael, we instantly knew that this was our venue from the second we walked in the door. We fell in love with the venue, both inside and out. The detail in the grand ball room and cocktail hour room is more beautiful than we ever could have imagined. The outside ceremony over looking the Long Island sound is absolutely breath taking! Everything about Soundview is classic, elegant and modern, which is exactly the feel we were going for. From the day we booked (which was over two years before our wedding), Michael and the rest of his staff always made us feel like family. Every question and concern was handled with care, even so far out from our wedding day. Our wedding was more perfect than we ever could have imagined. Michael and his entire staff are truly the best in the business! Our guests are still raving about the amazing food and the gorgeous style and decor two months later. 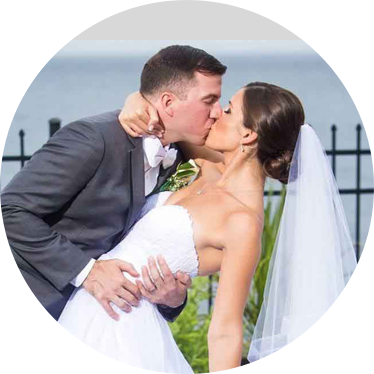 We absolutely recommend Soundview Caterers to anyone looking to plan an event on the gorgeous Long Island sound. Thank you, Michael for our perfect day! "